Want good television? and I mean REALLY good television? need something to watch until your favourite shows return post-strike? look no further than, well, CANADA. 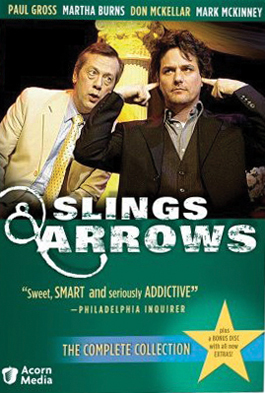 Ladies and Gentlemen, may I present to you one of my favourite TV shows of all time, from my home town of Toronto, Canada… SLINGS & ARROWS!!! This “comedy about drama” is one of the smartest shows ever on TV. only 6 episodes a season, this 3 season masterpiece is an easy watch and totally worth the commitment. The show chronicles the antics of a small town, big time theatre festival in Ontario (based not so loosely on the Stratford festival of Canada) called The New Burbage Festival. When Oliver Wells, the drama queen of an artistic director, dies, Geoffrey Tennant, a former actor in the company who is infamous for his meltdown during a performance of Hamlet, is asked to step in. But, Geoffrey finds himself revisiting his own madness as Oliver’s ghost returns to guide him through directing the festival’s production of Hamlet. The festival’s resident business man (Kids in the Hall’s Mark McKinney) and prima donna (Martha Burns) add some serious drama (and comedy) to the mix as well as a host of other splendid characters. The first season explores the festival’s production of Hamlet and guest stars the brilliant Rachel McAdams as the ingenue of the piece. The second season marks a ground breaking production of Macbeth, a tumultuous Romeo & Juliet and a re-branding of the festival led by an unorthodox ad executive played by Colm Feore. The third season: the most breathtaking Lear you will ever see (as played by Stratford’s late genius William Hutt), a comically bad original musical called “East Hastings” and a lovely character subplot from Oscar nominee Sarah Polley as the actress playing Cordelia in Lear. and did I mention that they have a new theme song every season? “Cheer Up Hamlet”, “I Wont Play Mackers” and “A Walk in the Rain” are hilarious (the lyrics are included on the DVD if you ever want to sing along). Any Shakespeare fan will adore this show. Any theatre person will love it. and Everyone else really should watch it too. The backstage antics are hilariously realistic, the plays are brilliant, the characters are lovable. You will be rolling with laughter, crying with emotion and standing up to cheer, seeing Shakespeare as you’ve never seen him before.